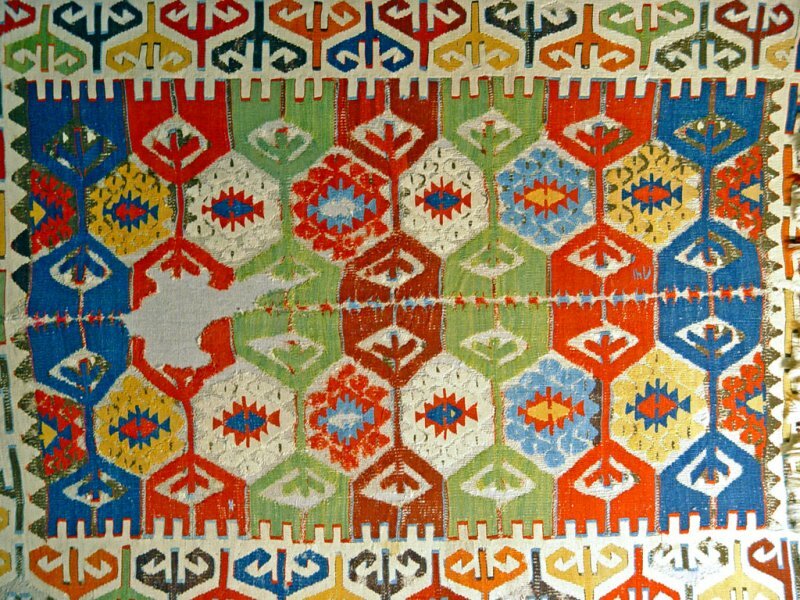 A Yörük kilim, woven in two parts and put together (horizontally) in the middle. Woollen weft on woollen strands. With two horizontal rows of hexagonal ‘Canavar Ayağı’ (Monster’s foot), symbolizing the Dragon, a creature believed to be the master of air and water and the guard of treasures and secret objects. A related theme is the fight of the Dragon and the Phoenix, which is believed to produce fertile rains of spring and connects both creatures with the themes of fertility and renewal. Above and under each row of ‘Monster’s feet’: a row of ‘Kaz ayağı’ (Goose foot), a symbol of prosperity and happiness. In the top and bottom borders: alternating ‘Koçboynuzu’ (Ram’s horn), symbolising male fertility, male power and heroism.